10 easy ways to make your home smell great! Bad smells can come from anywhere in the home. They can come from your vents, your fridge, or even your shoes. But thankfully there are some great ways to get rid of these bad smells. And they’re not hard to try either; they’re actually really simple and can take only a minute or so to apply. Also, they’re great options if you want to make sure you’re freshening your home with more natural smells. Now down below are some great ideas for smell hacks done by genius bloggers. So check them out and let me know what you think! If you find that your dishwasher is starting to have an odor, then get rid of it fast by running it with lemon kool-aid. It’ll be gone in no time! Tying up some eucalyptus in your shower is a great way to make sure that your bathroom smells fresh all the time. Also, the scent can help you relax while taking a shower. A great idea for naturally scenting your home is to put a few drops of essential oil onto your air filter. That way when air is blowing through, the scent of the oil (whether it’s lemon , mint , or lavender ) will go throughout your house. Whether it’s the cold season or not, I still think this idea of putting a vanilla scented candle in a bowl of coffee beans is a great idea. Then you can make your whole home smell like a latte. If you want to make sure your feet don’t sweat in your shoes (and then stink up a room), then spray the insides with dry shampoo before leaving. Garbage disposals can get pretty gross and start to make your kitchen smell. But with these awesome DIY disposal cubes, you’ll have things smelling fresh in no time. I’m kind of in love with over the stove (or slow cooker) homemade smells. They can really make your home smell like fall or the holidays. 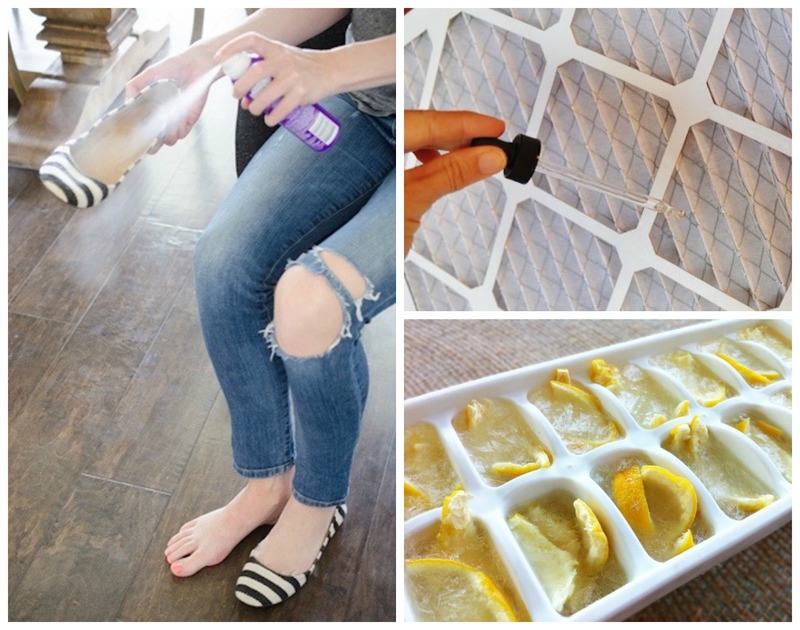 Now if you want a really quick and easy hack, then try clipping an air freshener to your air vent and let the AC do its job. I think that this hack is seriously awesome. If you have a big fan and an air filter, then definitely try this one out. If you have some guests coming over or even a date night at home (or you just want things to smell great), then try baking 2 tablespoons of vanilla extract at 300 degrees for 20 minutes. Life can get busy at times and the home can get a bit neglected. But even if you don’t have a lot of time for making sure everything in the house is perfectly clean, you can make sure that it stays smelling fresh. The smell is one of the first things people (and you) notice when entering the home. So using one of these super easy hacks is a great way to make sure that your place is relaxing and has a good scent.